After the disappointment of their Cup exit against Shelbourne, Waterford FC will be seeking revenge when they take on Owen Heary’s side at the RSC on Friday evening. Kick-off is 7.45pm. It was a busy weekend for the Blues with all three underage teams, Under-15, Under-17 and Under-19, in league action. Congratulations to our U17 striker Ciaran Brennan who has been selected in the Republic of Ireland U17 squad for this weekend's double header. 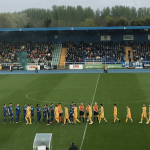 Waterford FC took another step in the race for the Premier Division title after a narrow 1-0 win at home to UCD on Friday night. Waterford FC return to league action this Friday evening as third-placed UCD visit the RSC as the Blues look to continue their push for promotion. Waterford FC is delighted to unveil our Under-15 squad for the inaugural U15 National League that kicks off this weekend. Waterford FC bowed out of the Irish Daily Mail FAI Cup after a 3-0 defeat at home to Shelbourne on Friday night at the RSC. Waterford FC switch focus from the league as Shelbourne visit the RSC this Friday as the sides look to book their place in the Irish Daily Mail FAI Cup second round. 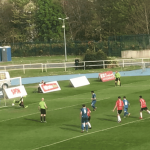 Waterford FC advanced to the final of the Mark Farren Under 17 Cup after a remarkable game saw the Blues beat Shamrock Rovers 4-2 after extra time at Ferrybank's Village Grounds on Tuesday last. Waterford FC had to come from behind on Friday to pick up a 1-1 draw against an in-form Cabinteely side in the SSE Airtricity League First Division clash in Stradbrook.